Amnesty International has called 2018 Iran’s “year of shame” for its “chilling” crackdown on the rights to freedom of expression, association and peaceful assembly. The charity’s new report, which focuses on the more than 7,000 people arrested for partaking in protests against poverty, corruption and authoritarianism, also highlights Iran’s “intensified discriminatory crackdowns against religious and ethnic minorities by arbitrarily arresting and imprisoning hundreds, and curtailing their access to education, employment and other services”. Citing Article18, Amnesty notes that “at least 171 Christians were arrested in 2018 solely for peacefully practising their faith… Some received sentences of up to 15 years in prison”. Last week, Article18’s inaugural annual report revealed that at least 14 Christians were still in prison in Iran at the start of 2019, after an unprecedented wave of raids on “house churches” at the end of 2018 led to over 100 Christians being arrested in just one week. 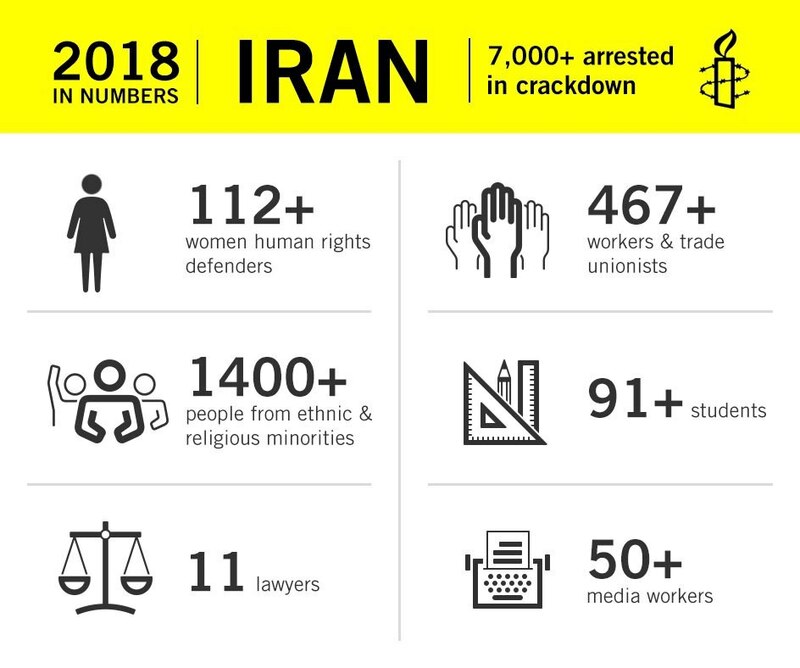 Amnesty’s report, released today, also highlights Iran’s repression of other religious minorities, including Gonabadi dervishes and Bahá’ís. “Hundreds [of dervishes] were arrested and more than 200 were sentenced to a total of 1,080 years in prison, 5,995 lashes as well as internal ‘exile’, travel bans, and bans on joining political and social groups,” Amnesty says. One dervish was reportedly sentenced to death after a “grossly unfair trial”, then “swiftly executed”. Meanwhile, Amnesty notes that an administrator of the Majzooban-e-Noor website, which reports on human rights abuses against the dervishes, was sentenced to 26 years and three months in prison and 148 lashes. At least 95 Bahá’ís were “arbitrarily detained”, according to Amnesty, citing data from the Bahá’í International Community. “Throughout 2018 the Iranian authorities have sought to crush the spirits of protesters and human rights defenders demanding respect for human rights by carrying out mass arrests and even grotesque flogging sentences,” commented Philip Luther, MENA Research and Advocacy Director at Amnesty International, in his concluding remark.